After​ ​getting​ ​the​ ​go​ ​ahead​ ​from​ ​the​ ​Arts​ ​Council​ ​to​ ​transfer the​ ​25,000​ ​DKK​ ​that​ ​the​ ​theatre​ ​had​ ​received​ ​in​ ​travel​ ​funding​ ​for​ ​the​ ​Pakistani festival,​ ​for​ ​the​ ​London​ ​project,​ ​Oskar​ ​Jankovic​ ​and​ ​Anne​ ​Nøjgård​ ​went​ ​to London​ ​to​ ​see​ ​the​ ​venue​ ​and​ ​talk​ ​to​ ​the​ ​organizers.​ ​”Brzydkie​ ​kaczatko”​ ​(The Ugly​ ​Duckling)​ ​was​ ​performed​ ​in​ ​Polish​ ​at​ ​the​ ​Pleciuga​ ​Puppet​ ​Theatre​ ​Festival in​ ​Szczecin,​ ​Poland​ ​in​ ​June.​ ​Difficult​ ​language,​ ​great​ ​success.​ ​This​ ​is​ ​the​ ​second time​ ​we​ ​have​ ​visited​ ​that​ ​festival. ​In​ ​November​ ​the​ ​theatre​ ​was​ ​invited​ ​to​ ​the​ ​Rafi​ ​Peer​ ​World​ ​Performing Art​ ​Festival​ ​with​ ​‘The​ ​Mole​ ​and​ ​the​ ​House​ ​that​ ​Came​ ​and​ ​Left’.​ ​First,​ ​the​ ​festival was​ ​postponed​ ​until​ ​December​ ​after​ ​which​ ​it​ ​was​ ​cancelled,​ ​due​ ​to​ ​a​ ​lack​ ​of funding.​ ​This​ ​is​ ​the​ ​first​ ​time​ ​this​ ​has​ ​happened​ ​to​ ​the​ ​Peerzada-family.​ ​It​ ​seems that​ ​art,​ ​at​ ​the​ ​moment,​ ​​ ​is​ ​increasingly​ ​being​ ​closed​ ​down​ ​politically​ ​in​ ​Pakistan. Nevertheless,​ ​Alena​ ​Peerzada​ ​asked​ ​if​ ​we​ ​could​ ​participate​ ​with​ ​‘The​ ​Border’​ ​at the​ ​‘Alchemy’​ ​festival​ ​in​ ​London,​ ​where​ ​she​ ​and​ ​Saadaan​ ​Perzada​ ​are​ ​the Pakistani​ ​curators.​ ​We​ ​hope​ ​this​ ​will​ ​be​ ​possible​ ​in​ ​May​ ​2018. ​‘The​ ​Ugly​ ​Duckling’​ ​plays​ ​in​ ​Schleswig​ ​Holstein​ ​for​ ​the​ ​Danish​ ​minority. I march, Lampe participated the International Folk Puppet Festival in Lahore, Pakistan, with the new show “Kasper and the Concert”. It is a travel show for one actor and one musician – with a scenography that together with the puppet Kasper, can be packed into the regular hand luggage. The show is directed by Niels Grønne. “The Border”. The Project involves three Pakistani artists in all, and the rehearsals started in may 2013. “The Border” will have its press premiere at 29th of March 2014 on Dansekapellet, Copenhagen. The production is supported by the Danish Arts Council's Committee for the Performing Arts, Bikubenfonden and CKU. The Danish-Pakistani collaboration continues with the production of the show “The Border”. “The Border” is directed by Søren Iversen, who also was in Pakistan in March alongside Anne Nøjgaard and musician Jonas Stampe. 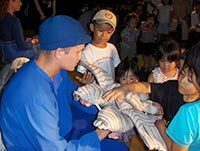 Besides the puppet festival, the goal with the journey was to find a new Pakistani collaborator, after the puppet maker Faizaan Peerzada passed away suddenly in December 2012. Fortunately we got a connection with Mirela Peerzada, a Rumanian-Pakistani puppet maker, who made the puppets for “The Border”. The Project involves three Pakistani artists in all, and the rehearsals started in may 2013. “The Border” will have its press premiere at 29th of March 2014 on Dansekapellet, Copenhagen. The production is supported by the Danish Arts Council's Committee for the Performing Arts, Bikubenfonden and CKU. actress/puppeteer, as well as an upcoming collaboration project, “A Border Tale”. Yamina handles the main character puppet in the new Pakistani version of “Sesame Street”, and she has achieved national fame as an actress in two TV-series. 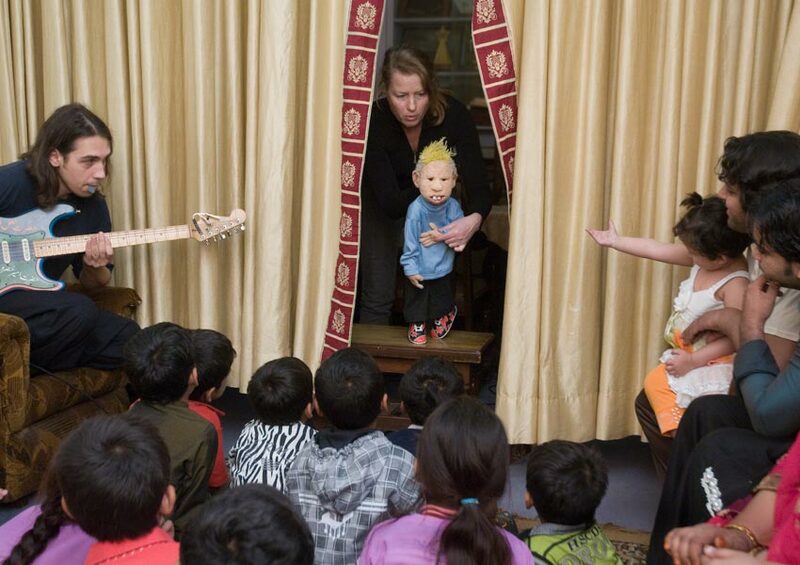 Anne Nøjgård had the task of doing an interactive demonstration at the Festival which resulted in our developing an improvisation with the two puppets (made by Martin R. Olsen) from our show “A Sandwich in Heaven” that we had brought with us. Anne and the puppet Casper started playing among the audience and approached the stage and a small podium where musician Jonas Stampe was playing electric guitar. On the stage we performed a small scene and concluded by bringing the other puppet, Carl, and a child from the audience onto the stage to play with us. 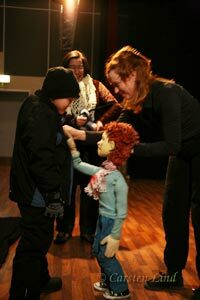 A great success that demonstrated how puppets and animation communicate effortlessly across barriers of language and culture. This will also form the theme of our next production for children, “A Border Tale”. “The Mole and the House That Came and Left” is to participate in the Mela Festival in Oslo this summer, and we will have the opportunity to meet with our friends from Pakistan there, too. "The Mole and the House that Came and Left" visits ”Festiwal KONTRAPUNKT 2011”. World premiere of “The Mole and the House That Came and Left” at Folketeatret in the middle of May in connection with the ASSITEJ World Congress. 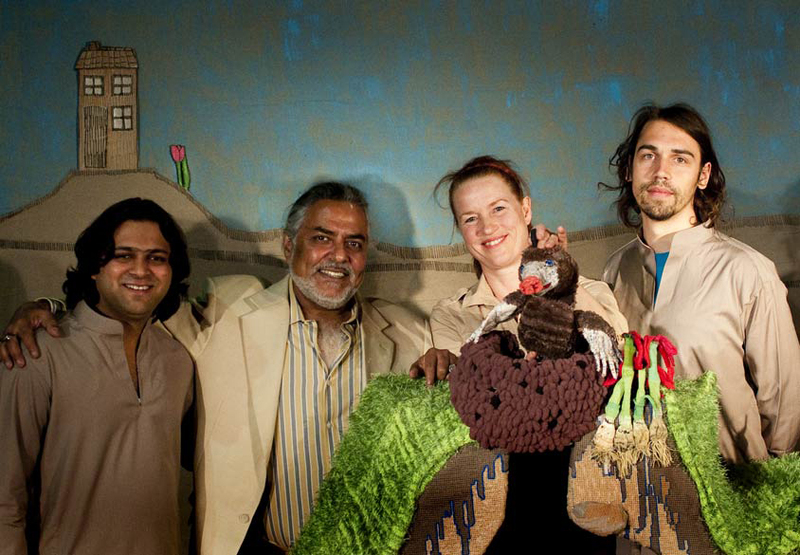 The show features actor and puppeteer Anne Nøjgård and Pakistani singer Ejaz Ali and musician Jonas Stampe. The production is an international collaboration project with the Rafi Peer Theatre Workshop and Faizaan Peerzada from Lahore, Pakistan, who also was present at the premiere. The performance should also had been played on the Melafestival in Olso in the end of July, but the festival was cancelled and replaced by a memorial for the victims of the massacre in Oslo and at Utøya. Tour in Pakistan and Norway (Melafestival) in 2012. “The Boy Who Was Born to Go to School” – 9 shows for the South Schleswig Association. 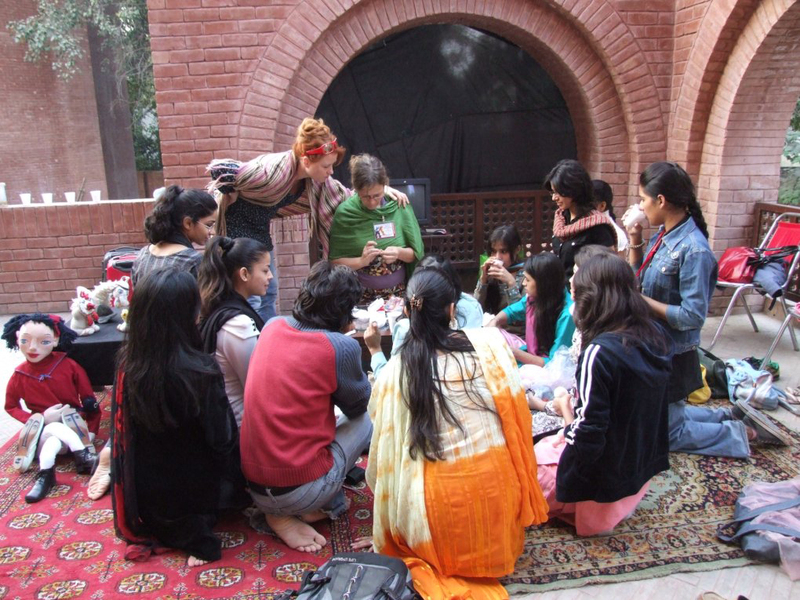 Pakistan: In December dramaturg Peter Jankovic and musician/composer Jonas “Snöleoparden” Stampe, were in Lahore, Pakistan to find a musician for “The Mole and the House that Came and Left” and to meet with our Pakistani collaborators, the Rafi Peer Theatre Workshop, run by the famous Peerzada-family. Jonas Stampe is to compose music for the project. Peter Jankovic is also Chairman of the ASSITEJ World Congress 2011 Seminar and Workshop Program Committee, and a member of the Executive Board. “The Ugly Duckling” – 4 performances on the at “Visioni di futuro, Visioni di teatro.. – International Festival of Theatre and Culture for the Early Childhood” Bologna, Italien. Anne Nøjgård gives a keynote speech on theatre for the very youngest "Theatre for Little Humans". The theatre drives on to Slovenia with actor Anne Kurtweil from "Det lille Verdensteater" who is also invited to the festivals with one of their shows. 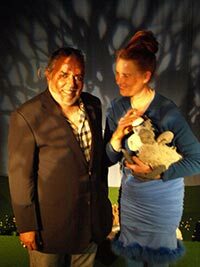 This forms the start of a national and internation collaboration, with Anne Kurzweil playing a part in "The Ugly Duckling". "The Girl Who Went Away" – 5 performances in the towns of Kvivik, Thorshavn and Sørvagur, invited by The Nordic House on the Faroe Islands. "The Ugly Duckling" – 2 performances in Moscow's Meyerhold Centre at the "Big Break festival". 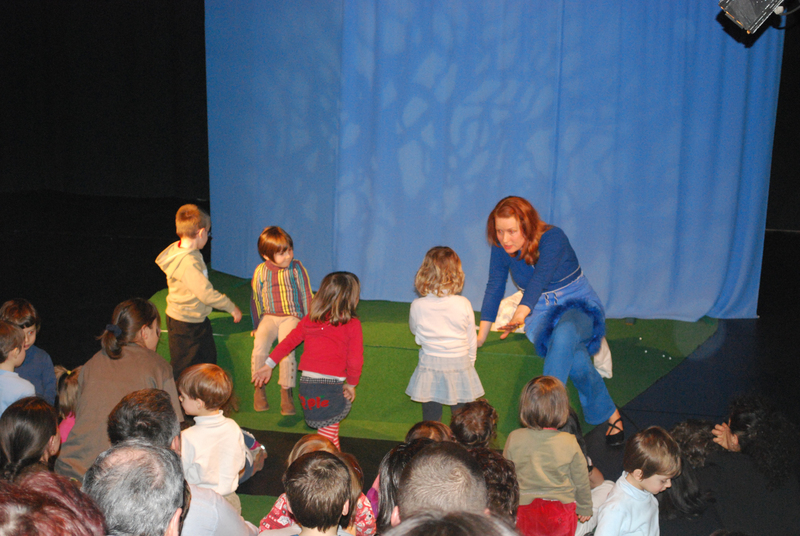 Anne Nøjgård participates in conference on "Theatre for the very youngest" with speech "Theatre for Little Humans". Peter Jankovic leads the international ASSITEJ collaboration project "Miracle" with Batida (DK), Pozoriste Bosko Buha (Serbia) and Istanbul Municipality Theatre (Turkey). Peter Jankovic, dramaturg and composer in Teatret Lampe is in Adelaide, Australia and ensures as Chairman of ASSITEJ Denmark (2007-09) that Copenhagen-Malmoe wins the bid for the ASSITEJ World Congress in 2011. Teatret Lampe participates in the World Performing Arts Festival with a puppet workshop in November 2008 led by Anne Nøjgård (actor and puppeteer), Marianne Jørgensen (visual artist and puppet maker) and Ali Rezar (interpreter). "The Girl Who Went Away" – 5 performances in Sisimiut and Nuuk, Greenland, presented by The Arts and Culture Centre, Katuaq. "The Stone Prince" (Okamenjeni Prins) - Teatret Lampe's award winng international co-production with Corona La Balance (DK), Malo Pozoriste Dusko Radovic (SER) and Pozoriste Lutaka Pinokio (SER) visits Denmark and plays at the April Festival in Viborg and the Spring Festival in Copenhagen. Peter Jankovic leads ASSITEJ collaboration project on Interactive Theatre between Carte Blanche (DK) and CEDEUM/Bosko Buha (SER) in connecton with the BITEF festival in Belgrade. 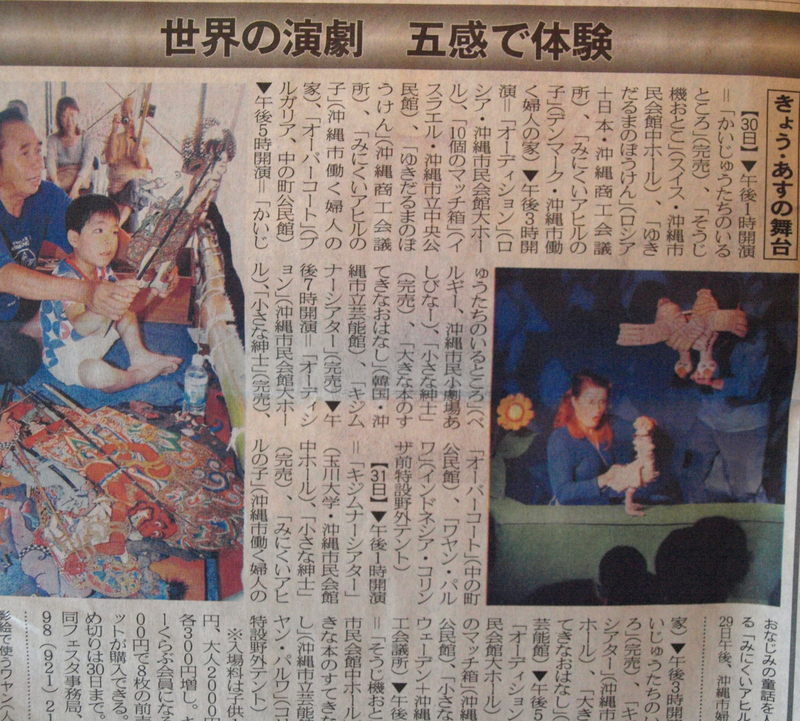 "The Ugly Duckling" – 5 performances at the international Children's Theatre Festival "Kijimuna" in Okinawa City July-August 2006. In November "The Ugly Duckling" tours Helsingfors, Åland and Stockholm on invitation of the Nordic Institute in Finland – 7 performances. In April Teatret Lampe and ASSITEJ Denmark send Peter Jankovic to deliver a keynote speech at a national congress on Theatre for Children and Young People in Poznan. The subject of the presentation was the Danish political system of Theatre for Children and Young People. The organiser is Centrum Sztuki Dzieka w Poznanu, and a 400 page report is written and published. With the help of ASSITEJ Denmark, Teatret Lampe initiates and is a partner in a collaboration project with the West Balkans concerning a youth theatre production of "Galefyrsten" by Henning Mankel with Serbian actors. Belgrade premiere on 14 October 2005. I connection with this collaboration project Peter Jankovic has held various presentations on Danish theatre for children and yound people at the TIBA-festivals in Belgade and at the institutional theatre Malo Pozoriste Dusko Radovic. 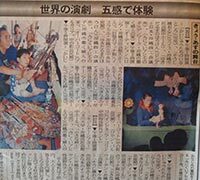 In May 2004 "The Ugly Duckling" plays 19 performances in Asiaat, Illulissat and Nuuk on invitation of The Arts and Culture Centre, Katuaq. On this occasion the documentary "The Ugly Duckling in Greenland - a culture encounter" by Anne Hermansen and Lampe (Anne Nøjgård and Ole Håndsbæk Christensen) holds a workshop with young theatre people in Asiaat. 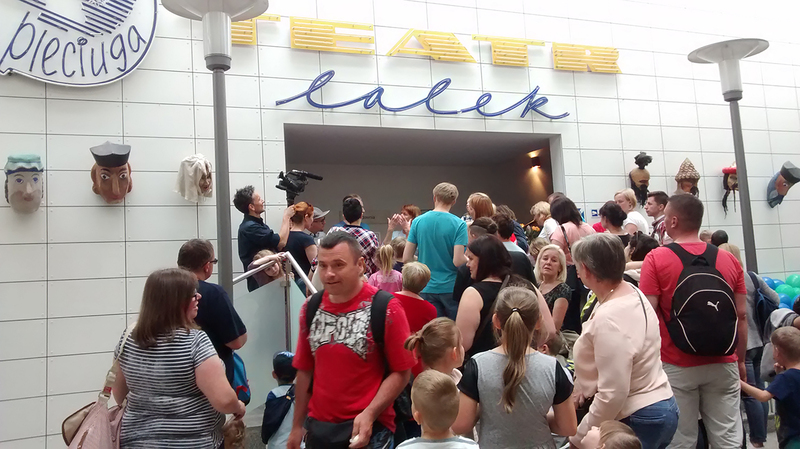 Teatret Lampe participates in the Banaanikaala Festival in Tallin. 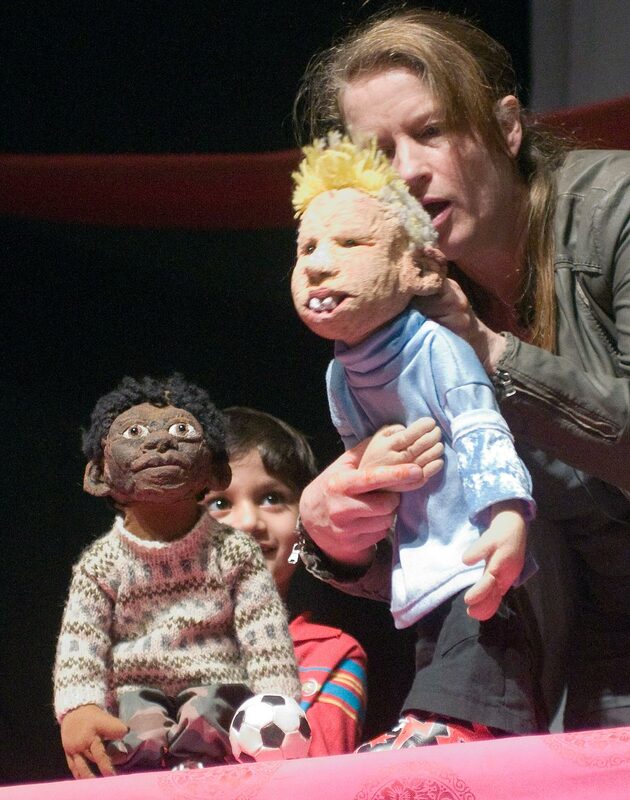 Anne Nøjgård wins the festival award for best puppet-actor. Collaboration commences with Kalmar Byteatern through actor and puppeteer Lars Sonnesjö, who is to take part in all Lampe's future productions as puppet animation consultant. Teatret Lampe plays guest performance at Bohusläns Teater, Uddevalla with "What a Cat!"